A number of prior fMRI studies have focused on the ways in which the midbrain dopaminergic reward system coactivates with hippocampus to potentiate memory for valuable items. However, another means by which people could selectively remember more valuable to-be-remembered items is to be selective in their use of effective but effortful encoding strategies. To broadly examine the neural mechanisms of value on subsequent memory, we used fMRI to assess how differences in brain activity at encoding as a function of value relate to subsequent free recall for words. Each word was preceded by an arbitrarily assigned point value, and participants went through multiple study–test cycles with feedback on their point total at the end of each list, allowing for sculpting of cognitive strategies. 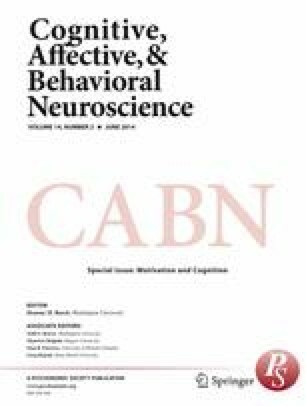 We examined the correlation between value-related modulation of brain activity and participants’ selectivity index, which measures how close participants were to their optimal point total, given the number of items recalled. Greater selectivity scores were associated with greater differences in the activation of semantic processing regions, including left inferior frontal gyrus and left posterior lateral temporal cortex, during the encoding of high-value words relative to low-value words. Although we also observed value-related modulation within midbrain and ventral striatal reward regions, our fronto-temporal findings suggest that strategic engagement of deep semantic processing may be an important mechanism for selectively encoding valuable items. The online version of this article (doi: 10.3758/s13415-014-0275-x) contains supplementary material, which is available to authorized users. Funding was provided by NSF Grant No. BCS-0848246 to B.J.K., and by a grant from the Scientific Research Network for Decision Neuroscience and Aging (SRNDNA) (subaward under NIH Grant No. AG039350) to B.J.K., M.S.C., J.R., and A.D.C. We thank Susan Bookheimer, Martin Monti, Gregory Samanez-Larkin, Michael Vendetti, and Aimee Drolet Rossi for helpful suggestions related to the design and analysis of this study. We thank Brian Knutson and Gregory Samanez-Larkin for providing scripts to run the MID task, and Vishnu Murty for providing an anatomical VTA atlas. We also thank Shruti Ullas for assistance with running participants. Portions of this work were presented at the 20th Annual Meeting of the Cognitive Neuroscience Society, San Francisco, CA, and at the Mechanisms of Motivation, Cognition, and Aging Interactions (MoMCAI) conference, Washington, DC.